An introduction to the wonderful world of chamber music designed for children aged 5 and above as well as the young at heart of any age. 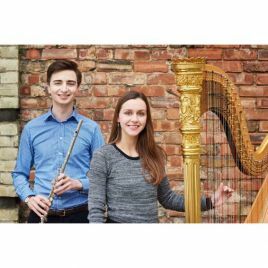 Using two of the most ancient instruments - flute and harp - Thomas and Rachel will demonstrate how to make beautiful sounds and will play music by CPE Bach, Piazzolla and other composers. This concert will last about one hour. Complimentary tea party for children & parents to follow, courtesy of Osbornes Law. 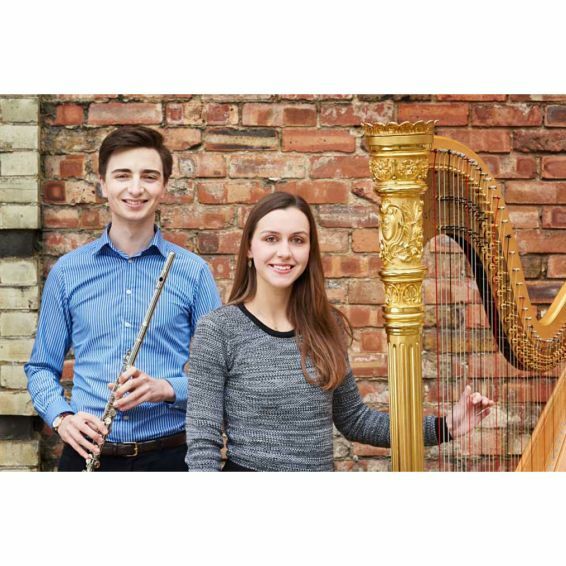 Thomas Hancox and Rachel Wick started playing together in 2007, when they met while studying at St Peter’s College, University of Oxford. They are now much in demand throughout the country, with performances at the Cheltenham and St Davids festivals, and in venues including the Wigmore Hall, Colston Hall, Kensington Palace, Penshurst Place, and Lauderdale House. They have also been guest artists on cruises for P&O and Fred. Olsen. Beyond their recital work, they work for Live Music Now, a charity that brings live music to those who would otherwise rarely, if ever, experience it, and also give educational performances for CAVATINA Chamber Music Trust and the Wigmore Hall. Last season, Thomas and Rachel commissioned and premiered a work by Robert Saxton, kindly funded by the PRS for Music Foundation and the RVW Trust. Thomas works regularly as guest principal flute with the country’s leading orchestras, including the Royal Philharmonic Orchestra, London Philharmonic Orchestra, Philharmonia Orchestra, Academy of St Martin in the Fields, English National Opera, and the English Chamber Orchestra, amongst others. Solo and chamber work has led to collaborations with artists and ensembles including the Allegri and Sacconi string quartets, Trevor Pinnock, Ilya Gringolts, Vladimir Mendelssohn, and Matthew Barley, with recitals in the Cheltenham, Spitalfields, St Davids, Canterbury, and Oxford Chamber Music festivals. Alongside his duo work for Live Music Now, Thomas is Chief Executive of CAVATINA Chamber Music Trust, a charity that introduces and makes available chamber music to young people. He currently teaches privately in London, having previously taught at King’s College London and the Dragon School, Oxford. Additionally he is a tutor on the ever-popular Flute Kitchen summer course in Harrogate. He first read music at St Peter’s College, Oxford, from where he graduated with a first, before pursuing further studies in Paris with Patrick Gallois, and subsequently at the Royal Academy of Music with Paul Edmund-Davies and Samuel Coles, finishing with a distinction and the honorary DipRAM. He was generously supported by the Countess of Munster Musical Trust, the Leverhulme Trust, the Arts and Humanities Research Council, the Musicians Benevolent Fund, and the Craxton Memorial Trust. A graduate of St. Peter’s College, Oxford and the Royal Academy of Music, Rachel works freelance as a harpist dividing her time between teaching; solo and chamber recitals; and session and orchestral work. She has played with the Royal Philharmonic Orchestra, Bournemouth Symphony Orchestra, London Concert Orchestra, London Gala Orchestra, English Session Orchestra, Symphony Orchestra of India, Orchestra Nova, City of London Sinfonia and European Union Youth Orchestra. She has recorded with New College and Christ Church Cathedral Choirs, Oxford and has broadcast live on Classic FM with Her Majesty’s Choir of the Chapel Royal, St James’s Palace, and appears on Howard Goodall’s album Inspired. Alongside a large private teaching practice, Rachel teaches harp at Berkhamsted School and the Junior Department of the Royal Academy of Music, and coaches for the National Children’s Orchestra. She gives solo concerts for the ‘Bach to Baby’ series as well as for ‘Live Music Now’. More unusual appearances of late include miming in an orchestra for the latest Mission Impossible film, and being filmed for Google’s ‘Inside Abbey Road’ virtual online tour.